We’re women, living in community, bringing God’s love to all people. 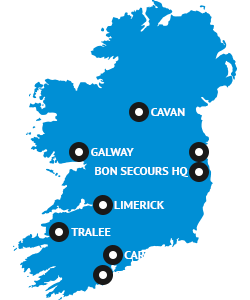 Bon Secours Hospital Galway is part of the Bon Secours Health System, Ireland's largest independent healthcare provider incorporating a network of five modern acute hospitals in Cork, Dublin, Galway, Limerick and Tralee. Situated in Renmore, our hospital which was established in 1954, is located just one mile from Galway city centre. Our aim is to provide the highest quality of care and service to the people of Galway and surrounding counties. Our 120 bed acute-care Hospital provides a wide range of surgical and medical services underpinned by the latest technology and expert medical Consultants. Our commitment to patient safety and quality improvement has resulted in the achievement of "Accredited Hospital Status", awarded by Joint Commission International (JCI), most recently in May 2017. This process confirms that our patient care and services meet world class internationally recognized standards and we are intensely proud of the care delivered to patients by our committed staff. Bon Secours Hospital Galway has undergone significant development in recent years with expansion of the main hospital and more recently the development of a new state-of-the-art Interventional Cardiology Suite.